Ships direct from int'l vendor. Allow 6+ weeks for delivery. 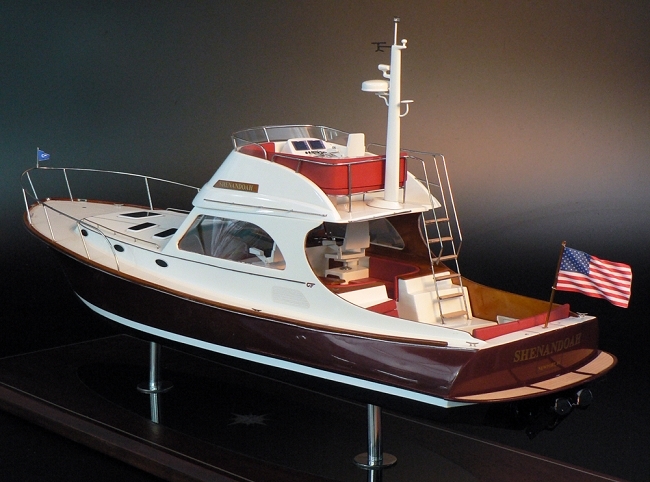 Custom-built scale model of Hinckley's popular and stylish Talaria 44 power yacht. Built to represent your boat - hull & topsides colors, your yacht's name and home port on the stern, national flag, as appropriate. Includes mahogany base, brass name plate, clear acrylic display case and light kit (display case, light kit are optional, but recommended) . 1/24 Scale = 22" LOA. Imported. Our vendor employs highly skilled craftsmen who work only with the finest materials. Hundreds of man-hours go into making each model, from the original lofting of plans to the finishing touches. Hull construction is either hand laid-up resin or plank on bulkhead with a selection of precious wood. Deck details are reproduced with custom-made brass and chromed brass castings. Hand sanded hulls are finished with marine varnishes and polyurethane paint. Their facility includes a department for custom models, 2 painting workshops, a professional wood workshop, a laser cutting department, a brass and resin casting section and also a chroming department. The company has its own engineering department working on the design of the custom models or the development of the new prototype for construction. Built to order. Call/e-mail for pricing of other size/scale models. Production time: 8-24 weeks depending on prior orders. Pricing dependent on size/scale of model ordered. Shipping options (above) are applicable to finished model, ready for shipment.